No one ever taught me how to write a dissertation. The last formal writing instruction I received was as an undergraduate, and as so many of us have learned the hard way, a 15 page term paper is a completely different proposition than a dissertation. 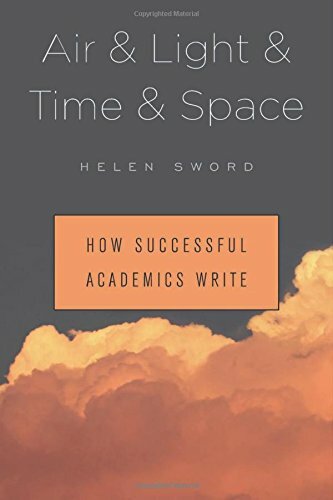 Dr. Helen Sword interviewed a hundred different successful academics about their writing habits, and then opened up the survey to a wide community of academics at all stages to get a wide range of perspectives. I appreciated her data-driven approach; the book is a mix of her cogent, insightful writing drawing themes and commonalities out of successful approaches, and individual author profiles. Many other books espousing a "way" to write as an academic feel anecdotal -- and while there is a lot of merit in sharing how things work for you, or how things have worked for you and all the people who subscribe to your method, it is still a trial and error proposition. If you're looking for Air & Light & Time & Space to lay out a step-by-step, data proven, fool-proof plan to become a productive, happy, academic writer, you're in the wrong place. But that is exactly what I appreciated about Sword's work. She instead identifies four key habits of the writers: Behavioral, Artisanal, Social, and Emotional, and showcases the diversity of successful practices in each area. Imagined as the foundation of a house, she stresses that different combinations of strengths can all produce productive writers. This model is generous enough to account for people who don't, won't, or can't write everyday, or who always work alone, or never work alone, or hate writing, or love writing. Rather than outlining a perfect system, she enumerates the elements that make a successful system. The difference produces a book that feels inclusive, rather than guilt-provoking. She provides a self-assessment quiz on her website to see how you stack up in each area: http://writersdiet.com/base.php . I recommend it taking it - the results are illuminating, and they're helpfully ranked in terms of frequency, just in case you want to see how common, or rare, you are! And I recommend the book, because it empowers you to build a writing routine and set of habits to support writing as it fits in your life, offering options rather than enforcing rules. For me, I'm working on writing more consistently (on regular days, if not every day!) and taking steps to build up my artisanal skills on my own writing (even editors have to learn how to self-edit!) And I'll be using this with my clients, to identify not how far they are away from an #AcWri ideal, but what methods resonate and appeal.